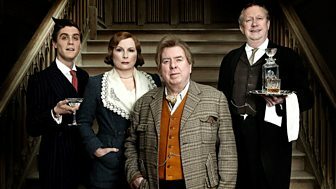 Comedy series adapted from PG Wodehouse, starring Timothy Spall and Jennifer Saunders. Join us as Beach gives a guided tour of Blandings Castle and its ancestral history. An all-star cast heads up BBC One's PG Wodehouse adaptation. Clarence Emsworth longs to be left in peace. But at every turn he is hounded by his imperious sister Connie, his feeble-witted son Freddie and a blizzard of love-struck nieces and their wildly unsuitable boyfriends with only his faithful butler Beach offering reluctant support. Who would be master of Blandings Castle?